STEEL SERVICE KREFELD GMBH, Comert cu produse siderurgice, Oteluri pentru unelte, Otel, pe EUROPAGES. Among other things, our company is one of Europe’s largest mill-independent stockholders for precision ground flat stock material and pre-machined tool steels. We have been distributing these products successfully since the year 2000. 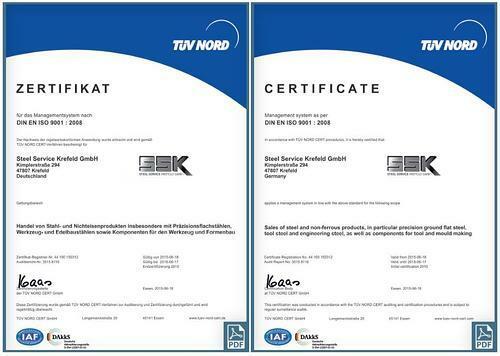 Steel Service Krefeld GmbH has held ISO 9001: 2008 certification since 2015. SSK keeps comprehensive inventory levels for precision ground flat stock and premachined tool steels of what is now more than 1500 tons at our warehouses in Krefeld (Germany) and Sheffield (United Kingdom). We are also stockholder of P-plates for the mold base industry in grades 1.1730 and 1.2312. 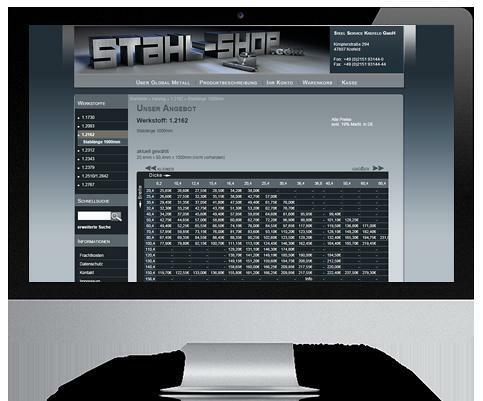 All products can be ordered online after registration by stockholders or retailers at www.stahl-shop.com. SSK also keeps its own extended inventories in tool steel flats in grades 1.2083 ESR – 1.2316 – 1.2343 ESR – 1.2358 QT as well as plates in grade 1.2312 or blocks in stainless steel grade 1.4112.